Hello all! Here is a short post on my routine for covering blemishes on the face. This post was requested by one of my friends and I hope that I can do my best! 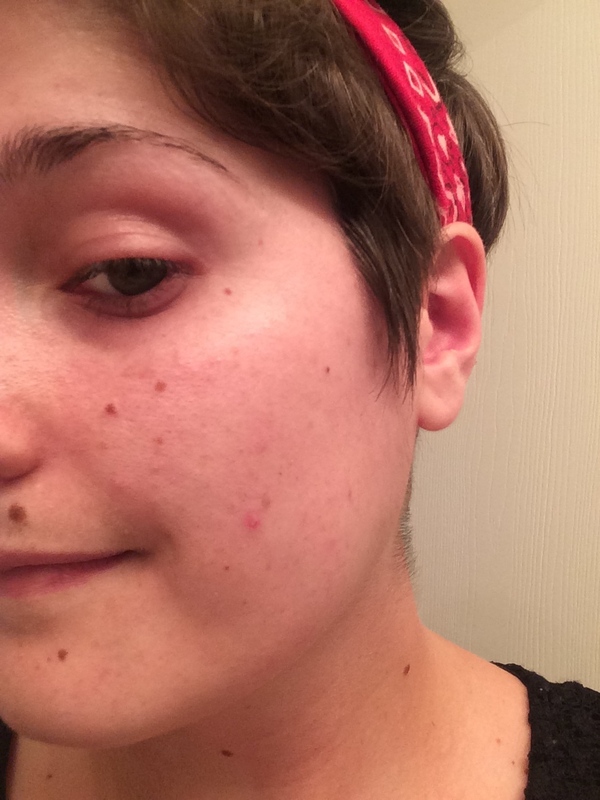 As you can see, I have candidly put a photo of one of my zits at the very beginning of this post. I did so because I want to remind you all that skin imperfections are normal and nothing to be ashamed of. In fact, you can leave them completely visible if you feel like doing so! Read on for my tips on coverage. Obviously it would be ideal if I had a big breakout to show this tutorial, however I’m not going to curse the fact that I have pretty good skin. I have never had a severe acne problem, so if you do I hope I can help as best as I can. The key thing to remember is that your zit is probably going to be somewhat visible. We are simply trying to deemphasize the spot as much as possible. It is important to realize that people might notice that you have some blemishes but they shouldn’t care. We’ve all gone through it and if someone does care they aren’t a very empathetic person (Maybe you should just ditch that friend also!). I started off with my regular skincare routine. The most important thing is a good application of moisturizer. I know what you’re thinking, “Why would I put moisture on an oily zit?” I understand your hesitation, but remember that you zit is still your skin. You have to keep taking care of it (And that means not popping as well! That is just like ripping open your normal facial skin!). Next is a light coverage of foundation over my entire face to neutralize any regular hyper pigmentation and unevenness. The key to concealing blemishes is to keep the products to a minimum. Don’t apply huge amounts of concealer or foundation. It will only make your face feel and look worse. Next up is concealer. I applied my regular concealer under my eyes and on my red spots before putting a small dab on the zit. I use the Maybelline Fit Me Concealer in Light, which is a bit yellow for my skin tone, but it blends in really well on the face for blemishes. I prefer a creamier concealer generally because it doesn’t dry out your zit. I think the best method is to dab the concealer with you finger or a sponge in a tapping motion. This keeps as much product on as possible because you aren’t accidentally wiping any off. Above is the finished concealing. The redness is considerably lessened and the blemish blends into my skin much more. It is still visible, which makes sense because it is textured and part of the face, but it is very diminished. From a distance I doubt anyone would notice at all. That is the finished coverage routine! It is critical that you treat your zit gently like the rest of your skin and prioritize skin health rather than a crazy makeup coverage routine. And remember, your face is not a series of imperfections, but a unique part of you! You don’t need to cover a single thing unless you want to! I hope this tutorial helps some of you out! Comment below if you have a favorite blemish concealer! This entry was posted in How-To and tagged blemish concealing tutorial, concealing tutorial, maybelline fit me concealer, zit concealing tutorial. Bookmark the permalink.